The solar energy market is estimated to be worth $140 billion by 2023, and countries like China (with 46% of current global capacity) are positioning themselves financially, and environmentally, as innovators in green energy. Germany, already leading the charge, is fully committed to renewables, so much so that one day this year, the often overcast nation had a surplus of renewable energy on the grid and basically had to pay people to use electricity. Ditto for the UK, where even the perpetually cloudy England just announced construction of its largest solar plant, completely funded by private companies and subsidy-free. In Arabic, noor means “the light,” and the Noor 1 solar plant in the Moroccan desert is an oasis offering not refuge from the sun, but a means of harnessing it. Visible from a popular desert trail leading into the town of Ouarzazate, the scope and scale of the project is obvious. Noor is part of a three-plant CSP project (unlike the photovoltaic panels you see on rooftops, CSPs or concentrated solar power, use solar mirrors to focus the sun’s energy and heat, which then produces steam that drives generators). Morocco currently imports almost all of its energy, but has committed itself to solar power, and the Noor project will be the largest in Africa and one of the biggest CSPs in the world. According to a press release by the World Bank and the Clean Technology Fund, one of the major financial supporters of the project, it is estimated that Noor will supply “power to 1.1 million Moroccans by 2018" and “reduce the country’s energy dependence by about 2 and half million tons of oil, while also lowering carbon emissions by 760,000 tons per year.” This shining beacon in the desert is an example of Morocco’s ambitions to become an energy leader on the African continent as more nations take advantage of their geographical assets to position themselves at the forefront of the green energy revolution. 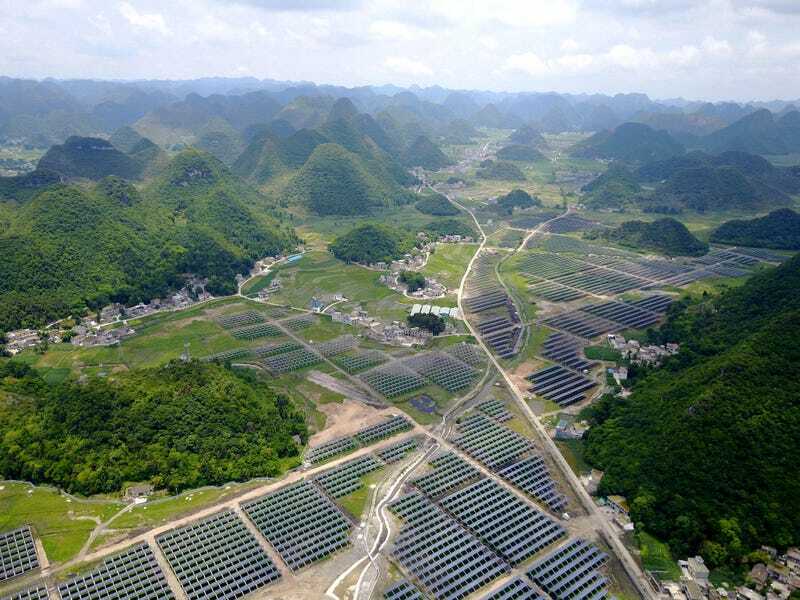 Then there’s China, which has done an energy about-face and is now a green energy champion. China has recently announced the Panda Power Plant in Datong, a panda-shaped solar field meant to draw support for the nation’s move towards green energy. Seemingly a cute marketing ploy, the Datong facility will be part of 100 similarly charming but very serious solar projects. And in an example of how we can literally build a clean future upon our dirty past, the city of Huainan, the unofficial capital of the country’s coal industry, has just begun operations at the world’s largest floating solar power plant. This massive solar project the size of 165 football fields sits upon the flooded remains of a coal mine. With China still heavily invested in cheaper coal energy, this project is a glaring real-life and symbolic example of seeing beyond one’s short-term interests. Other projects stand out by virtue of their bold commitments and big ambitions. Again in China, the Longyangxia Dam Solar Park in the western part of the country, claims to be the world’s largest, with over 4 million solar panels in one massive 27 sq km field. Last year, India launched the Kamuthi facility in the southern province of Tamil Nadu, covering an area of 10 sq km and claiming (at the time) the title of largest solar plant in the world. Built in only 8 months, this project is part of India’s commitment to power 60 million homes by the sun by 2022 and produce 40 percent of its power from non-fossil fuels by 2030. Abu Dhabi in the United Arab Emirates is on track to launch the world’s biggest photovoltaic plant in 2019. Built in association with Chinese and Japanese solar companies, this facility will have a whopping 1.2-gigawatts of capacity and record-low rates of KW per hour. And Saudi Arabia has laid out a plan for 30 solar and wind projects as part of a $50 billion renewable energy program that is attracting bids from players around the world. Amid all of this creative development, the United States seems to be stepping away from any leadership on this issue. Though the U.S. invented solar technology, China has definitively overshadowed America’s stronghold in the industry (as other countries are also making moves to expand their industries). With the current administration’s strange focus on fossil fuels, and its recent removing of words like “climate change” and “global warming” from government websites, it looks like America is recusing itself from both the financial and moral opportunities ahead.